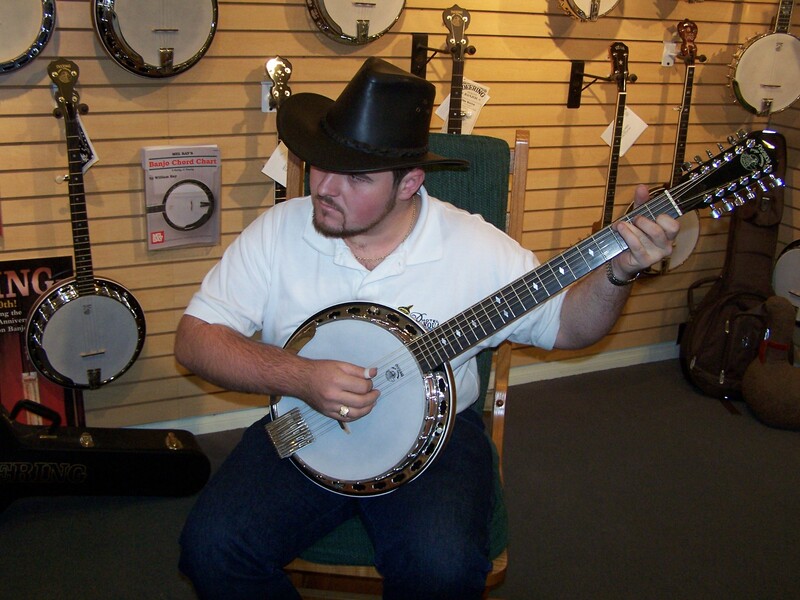 To answer how I learned to play the banjo, it would be useful if you first knew how I learned to play the guitar. You can do that by clicking here. If for now, you would rather just continue reading here, that is fine as well. My story begins back in 2007 when my dad and I were touring the U.S.A. While we were in Southern California, we decided to visit the Deering Banjo factory. I heard of the Deering brand a few years before, and that they made some of the best banjos on the market, including some fantastic 6-string banjos. I also heard that they even made a 12-string banjo. Since we were in the area, I thought a tour of their factory would be fun, so we made an appointment for a tour. At the time, there had been a big wildfire in the area. That might have accounted for the fact that Dad and I were the only ones taking the tour that day! A private tour of the factory was indeed a real treat, and we had the chance to see how raw pieces of lumber and metal are turned into fine works of art! Mrs. Carolina Bridges gave us the tour. She also just happened to be the “Artist Relations” person. At the end of the tour, Carolina brought us into the showroom where there were floor-to-ceiling banjos! That was quite a sight! I had a fair bit of experience using alternate tunings on the guitar like DADGAD, Open G and similar tunings. So, it wasn’t that difficult for me to “sound” like I knew what I was doing on the 5-string banjo. Carolina was very gracious. She permitted me to play several banjos so that I could understand what made each one unique. The distinctive sounds were a result of the various wood, and metal alloys which were used to create deep resonant tonal qualities. It was a great experience, but near the end of the tour, I noticed that there were no six or 12-string banjos displayed on the wall. When I enquired about a 6-string, she found one in the packing room that was not yet prepared for shipment. That gave me the opportunity to try one out. It was a Boston model and it was loud! It really was an excellent banjo. After playing a few tunes, I asked her how it compared to their 12-string model. Well here is where that wild fire becomes important! One of the employees lived very near the fire danger zone. As a precaution he brought some of his personal instruments in to work with him… one of which was the very first 12-string Deering ever made, a D-12 (Deluxe 12-string). He kindly allowed me to play the “Grand piano of banjos”. My dad, a man who is not easily impressed by 12-string guitars, was quick to point out that this 12-string was the exception and that it truly was an incredibly special instrument! My playing quickly brought many people from the factory floor, the packing room, and the offices. Dad overheard some employees saying; “I thought there was a group in playing in the showroom, but its just one guy!”… one man said, “I never thought a single banjo could sound like that!”… this was truly a special time, but not yet the time to pursue an artist relationship with Deering Banjos. It wasn’t long before my parents and I went on our first tour in Europe (2008) and life went on. I eventually forgot about the lovely experience I had at the Deering factory and after our tour in Europe was completed, we returned to Costa Rica where we have been full-time Christian missionaries since the late 1990’s. In 2009 and 2010 I had the opportunity to work as a live sound technician, so my dad and I went back to the U.S.A. to do this in several conferences and events. Although I was often performing at the events, my primary duty was that of being the sound tech. That was all great, but I was just not as focused on music as I wanted to be. By the middle of 2009 I was frustrated, and a bit burned out as well. I realized that being a “sound guy” was not what I wanted to do as a career. The pay wasn’t all that great either. However, I learned a lot of valuable skills while doing that and along the way, I met some great people! I knew that I needed some inspiration in my musical life, but getting another guitar wasn’t going to do the trick. While I was in the Atlanta, Georgia area, a friend of mine invited me to sit in with his bluegrass group at a Bluegrass Festival up in the Smoky Mountains. It was just what I needed to get my musical batteries recharged! I didn’t have my guitar with me, but my friend had a Taylor and a Martin guitar with him. They were both great, but I felt more comfortable with his Taylor 710 LTD. It is an amazing guitar made out of Cocobolo wood. During an all day jam session, instruments get shifted from person to person, and at one point, my friend had handed his Martin to someone else. He needed his Taylor guitar for the next song, so in its place he hands me his old 6-string banjo! I didn’t exactly know what to do with it, but then he said; “it’s a 6-string banjo tuned the same as a guitar. Have fun, you’ll figure it out”. Wow! After the first time playing through that song, I felt musically reborn! In fact, from that point on, for the rest of the festival, he couldn’t get his banjo back again! The 6-string banjo was exactly what I was searching for… I just hadn’t realized it before. The saddest part of a Bluegrass Festival of course, is that it must end! So, I did end up returning my friend’s 6-string banjo. However, I realized that I just HAD to get my own 6-string banjo… but how? It was then that I remembered my day at the Deering Factory. I found their number in my contacts list and I gave them a call. This is where my story gets to be more interesting. At the time, my dad and I were staying with a friend who also had a long-time friend of his visiting from out of town. That morning, I called Deering Banjo Company knowing that I was supposed to speak with the Artist Relations person, but as it turned out, Carolina, the woman that had given dad and I a tour two years before, was not in at the time. I left a voice message explaining who I was, when I had met her, and that I was ready to pursue an Artists relationship with Deering Banjos. Later that afternoon, I still hadn’t heard back from her and my friend’s company was getting ready to leave. He wanted me to play a song before his friend left. So, I got my guitar out and played “Cannonball Rag”. About halfway through the song my phone rang and my dad answered it for me. It was Carolina, the Artist Relations person at Deering. Dad asked for her to hold while I finished the song. When I got on the phone, she told me that she liked what she heard, and asked me if I would be interested in an artist relationship”! Of all the times for her to return my call, it was when I was playing one of my favorite songs! That also helped to remind her of the time that I played at the factory. Back then, I didn’t have any videos posted on-line, so it was a big blessing for me to have her hear me again. After examining the Deering product line via the Internet, I decided to custom order a Deering Deluxe 6-string (D-6) with the all Walnut Neck and Resonator and Ivoroid Binding—a truly beautiful instrument to hear and to hold! While awaiting the delivery of my new D-6, I found out about a vintage Deering Boston 6-string (B-6) for sale… it was such a discount I couldn’t pass it up, and within a week of receiving my D-6, I also received a B-6 as well! They each have a distinctive voice and I enjoy playing both of them. While I was on tour in Europe (2013/2014) I took my D-6 with me. I represented Deering Banjos at the Musikmesse in Frankfurt, Germany (2014). It was such an inspiring time for me and allowed me to feature some of the tunes I had been developing over the years since I started playing the banjo. As a result, I received a great deal of positive feedback at the show! 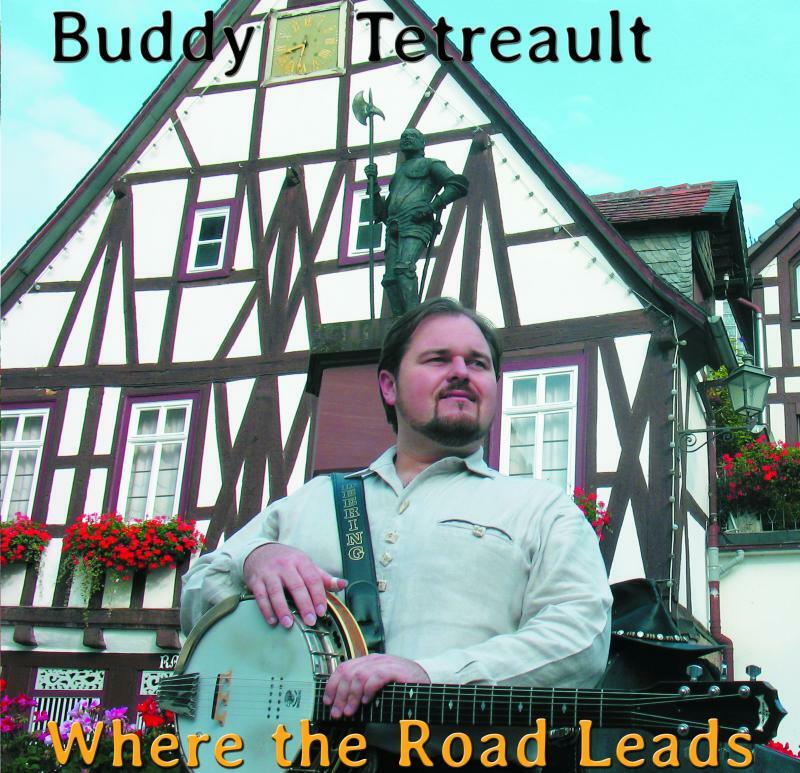 So, a few months later while still in Germany, I finished composing the last of the songs for my CD “Where the Road Leads” and for the first time recorded and released some of my music for the banjo. One of the songs I released on that CD is “The Disco King” AKA, “The Fiery Spaniard,” which is a high energy song! It mixes elements of traditional flamenco guitar playing techniques with an ’80s Disco rhythm but played on the banjo. It is very non-traditional, but loads of fun to listen to and to watch! Among the things that the banjo has done for me is that it has permanently changed the way I play the guitar in a very positive manner! If you have a minute, you may like to read an article I wrote for Deering Banjos. Click here. If you got this far, I thank you for sharing the journey with me. It has been a fun journey for me. I hope that if you play the banjo, or guitar, that you have a great adventure as well. I look forward to what the future holds, but in the meantime, I am always “a pickin’ and a grinnin’”!